Culture. Change the attitudes and behaviours. Set new aspirations, expectations and goals. Automation is non-negotiable. You can't go faster and at the same time maintain or improve quality unless you automate work. Flow. Lean is the leading methodology for improving flow, but its not about Lean, its about Flow of change, from Request to Deploy. Smoother, faster, better, more effective, more efficient. Feedback. Measurement is important but only for what we do with it: be data driven. 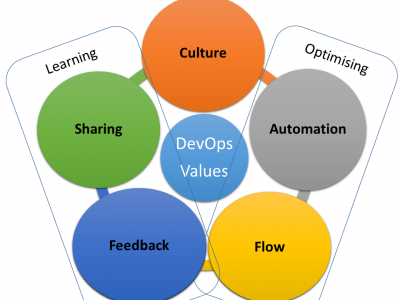 As The Three Ways makes clear, DevOps depends on fast feedback, to make the flow stable/smooth, faster, and higher quality. Sharing or Community (CAFFC?? ): building connectivity, cross-silo cooperation, flow of knowledge, mutual support, teaming. CALMS or CAFFS, either way it is a handy shorthand for the primary goals or values or areas of DevOps.